Always fasten your seat belts before driving off. – Adjust the front seat and head restraint correctly before putting on the seat belt, “Seats and storage”. – To fasten the belt, take hold of the latch plate and pull it slowly across your chest and lap ⇒ . – Insert the latch plate into the buckle for the appropriate seat and push it down until it is securely locked with an audible click ⇒ fig. 209. – Pull the belt to check that it is now securely fastened. The three-point inertia reel belts are tensioned automatically. The retractor system gives complete freedom of movement, as long as the pull on the belt is slow. Hard braking locks the belt. The belt will also lock when you accelerate, drive up or down a steep hill or in a sharp curve. • Always make certain that the belt is positioned properly ⇒ fig. 208 – risk of injury, “Adjusting the seat belts”. • The latch plate of the belt must always be engaged in the correct buckle for that seat. Otherwise the belt will not be fully effective and the danger of injury increases. The height of the front seat on your vehicle can be adjusted in order to match the position of the seat belt to your height. • The diagonal part of the belt should never be positioned across the neck, but roughly over the centre of the shoulder; it should fit closely against the upper part of the body. 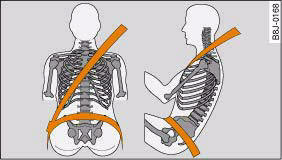 The lap part of the belt must be worn tightly across the hips, and not over the abdomen, fig. 210. Pull the belt tight if necessary to take up any slack. • Always make sure that belt is positioned properly. 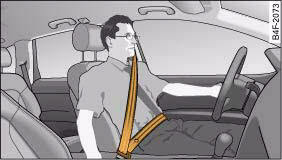 Incorrectly worn seat belts can give rise to injuries even in a minor collision. • Seat belts worn too loose can result in injuries because they allow excessive forward movement in a crash; the occupant will be brought to a sudden stop by the belt webbing. To afford the best protection for the unborn child it is important for the mother to wear the seat belt properly at all times. 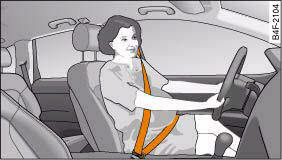 Women should always ensure they adjust the seat belt correctly during pregnancy. – To fasten the belt, take hold of the latch plate and pull it slowly down across your chest. 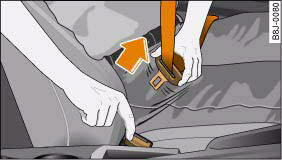 Wear the lap portion of the seat belt as low as possible over the hips so that there is no pressure on the stomach ⇒ fig. 211, ⇒ . – Insert the latch plate into the buckle for the appropriate seat and push it down until it is securely locked with an audible click, fig. 209. During pregnancy, women should especially make sure to wear the lap portion of the seat belt as low as possible across the hips so that there is no pressure on the stomach. Seat belt height adjusters can be used to adjust the height of the shoulder portion of the seat belt. 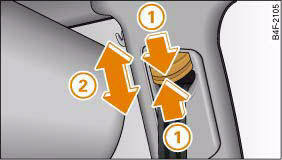 – Compress the adjuster 1 and slide the guide fitting downwards 2. – After adjusting, pull the shoulder belt sharply to check that the catch on the guide fitting is engaged securely. • The shoulder portion of the seat belt must be positioned roughly midway over the shoulder – it must never rest against the neck ⇒ in “Adjusting the seat belts” on page 197. 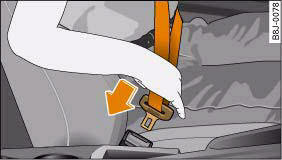 • It is also possible to adjust the height of the front seats to obtain the best position for the front seat belts. The red button releases the belt from the buckle. – Press the red button in the seat belt buckle ⇒ fig. 213. The latch plate will spring out of the buckle. – Guide the belt back by hand so that it is taken up by the retractor.